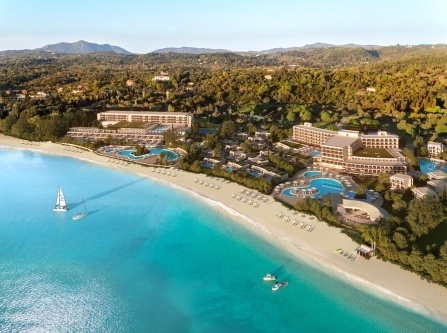 A family-owned ecological resort stretching across 1,000 acres, with golden beaches and the beautiful pine forests of the Kassandra peninsula. 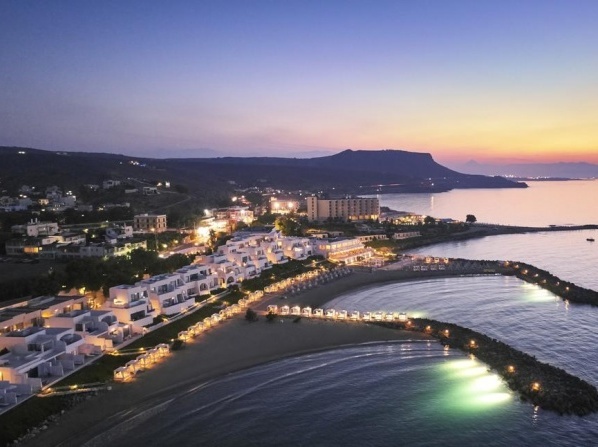 The hotel is set on a breathtaking sandy beach in Messinia, offering easy access to the best and most well-known monuments of the area. The stunning beachfront location of Cavo Tagoo Mykonos is certain to enhance your luxurious experience and make you feel like royalty. The hotel boasts a beautiful beachfront location, offering guests direct access to the beach. 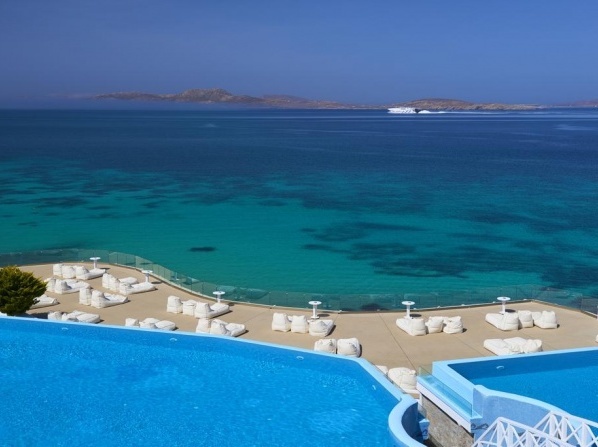 Directly by the sea front, this resort features stunning Greek architecture, divine azure views, fabulous accommodations, captivating scenery and an impressive AnaNeosis Thalasso Spa. 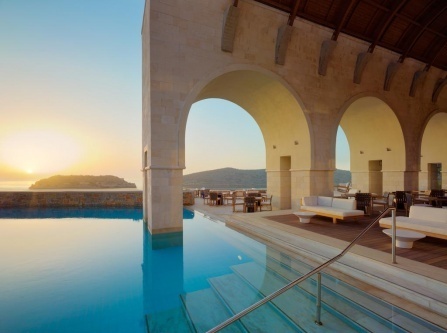 The honeymoon of your dreams is bound to become reality in this luxurious hotel in Rhodes. With comfortable and lavish accommodation, spectacular location, breathtaking views and excellent amenities and service, you and your loved one will spend the most romantic and memorable honeymoon. The 250 luxury guestrooms and more than 60 private use pools which are offered by this luxury 5 star hotel feature pleasure-seeking details. 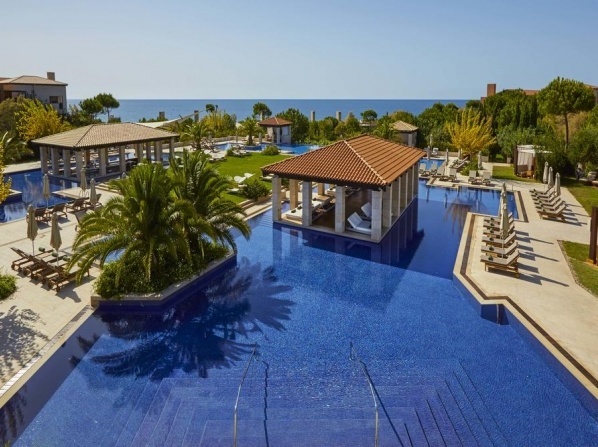 A 5 star beach resort in Agios Ioannis Peristeron. Peaceful, airy and sun drenched all rooms provide the perfect place to rest and relax. 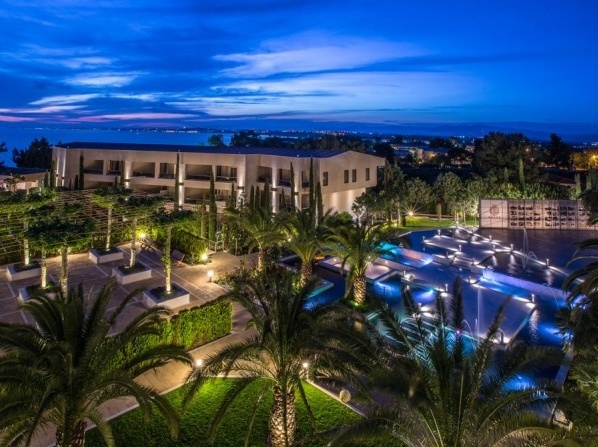 Featuring a beachfront location in Kallithea, this 5-star hotel has a lagoon-style pool, an 8600 ft² spa center and a hydro-massage pool. 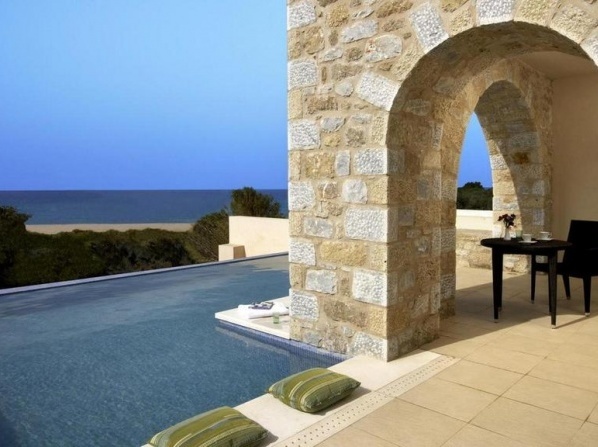 Discover a haven of luxury accommodation in Rhodes where in-room comfort and the highest of standards are combined with pure elegance like nowhere else on the island. Anax Resort and Spa offers direct access to the beach that is in front of the hotel. "The Pomegranate Wellness Spa hotel" is regarded as one of the best new hotels in Halkidiki and the most amazing new spa resort in Greece. 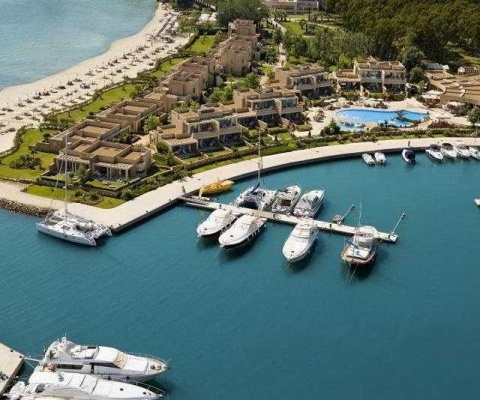 It is located on the west coast of Halkidiki, among the Kassandra and Sithonia peninsulas, only 30-minutes away from the international airport of Thessaloniki. The hotel features 172 side-sea and garden view rooms as well as luxury and prestige suites, three fine dining buffet and a la carte restaurants and four bars. 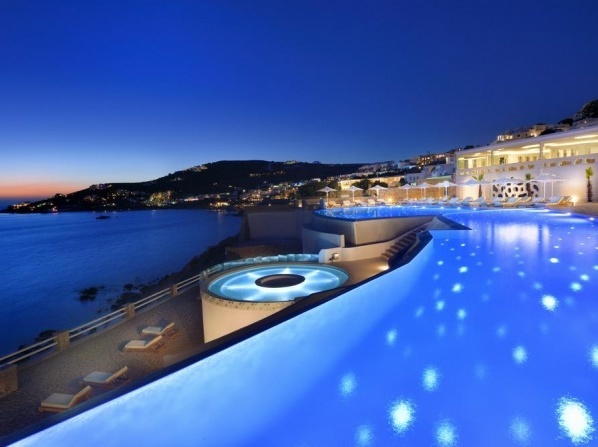 It also has a lagoon style outdoors and a sea water indoor swimming pool and an amazing spa. It’s that time of the year when you can’t think of anything else than jumping right into your swimsuit and straight into the cool, blue sea. If you are in desperate need of a beach, sun and sea holiday, then Greece is just the right pick for you. With over 2.500 beachfront hotels all over the country, and especially on the countless picturesque islands, there’s unlimited choice to find your perfect holiday paradise. There are about 400 beaches in Greece on a total of 13.000 km coastline that have been awarded the Blue Flag, signifying their superior water quality, cleanliness, organisation, safety and environmental standards. In this category, Greece ranks among the top 3 beach countries worldwide. If you’ve experienced the magic of Greece’s waters and beaches once, you’ll know it’s not a myth. Travelmyth is here to make your choice a bit easier and lets you combine your search for the ideal beachfront hotel with over 50 other categories. So, whether you are up to travelling with your family or looking for an adult-only honeymoon escape, whether you want to get pampered with an all-inclusive luxury package or need nothing more than a simple room by the beach, the choice is yours. Beachfront hotels let you experience the luxury of direct view and access to a private or public beach. 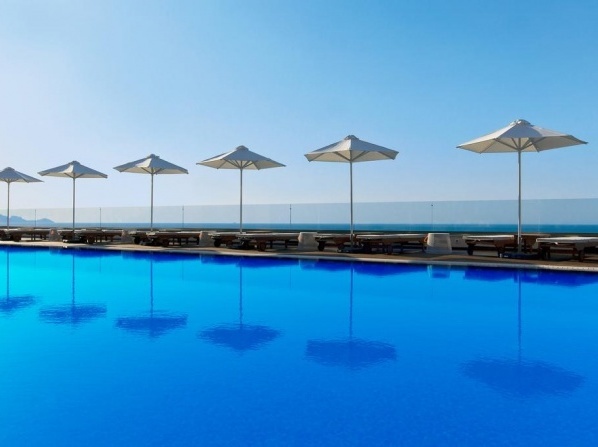 Often, these hotels offer additional included services and amenities such as umbrellas, sun beds, beach bars and water sports activities, making it a perfect pick to spend your whole day by the water. Check the descriptions in your search results for more information. 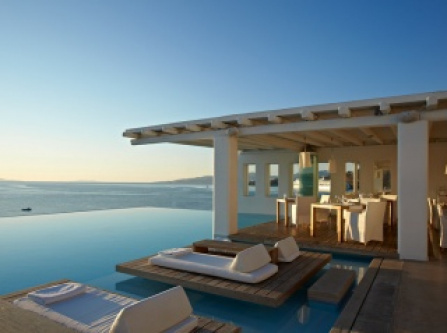 Most beachfront hotels in Greece can be found on the islands of the Southern Aegean, such as the Cycladic islands of Naxos, Ios and Sifnos. These islands provide not only dreamy beaches but will astonish you with their authentic Greek island charm, culture and typical blue-white architecture. 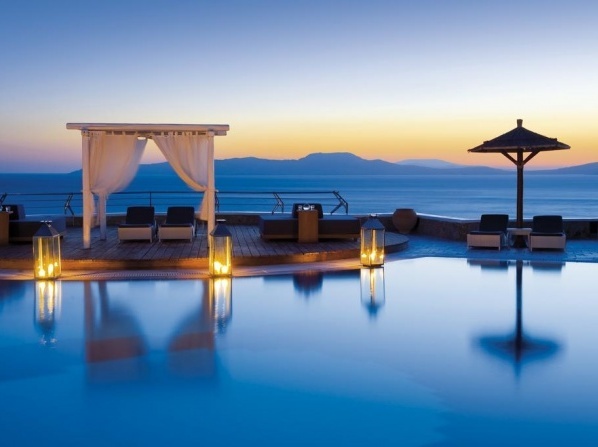 The second region with the most beachfront hotels in Greece is Crete, followed by the Ionian Islands in the country’s west and the Dodecanese islands in the south-east. Every single island such as Corfu, Rhodes or Kefallonia features a unique cultural identity, cuisine, traditions, landscapes and beaches with their very own characters that are worth to discover (one main reason that you’ll keep coming back to Greece!). 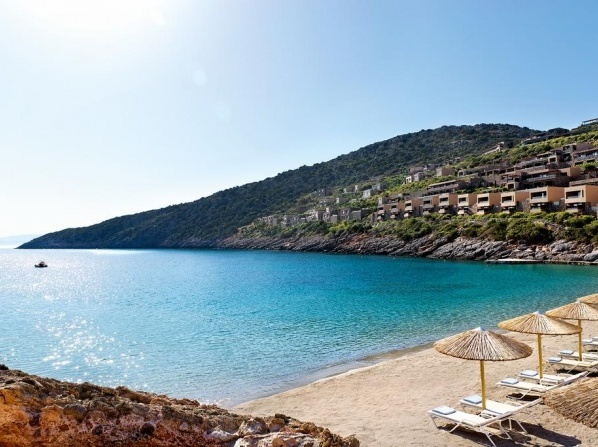 But also the Greek mainland including the Peloponnese and Central Macedonia offer plenty of amazing beaches with hotels and resorts located right at the best spots. 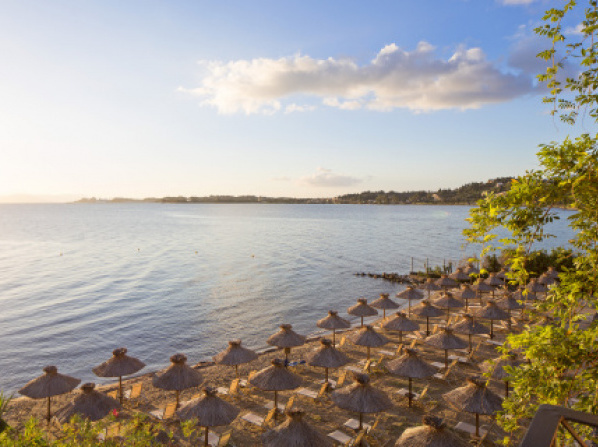 The three-finger peninsula of Chalkidiki for example is famous for its waterfronts, ranging from sandy to pebble beaches with panoramic views and lush vegetation at the back. The choices are indeed unlimited. Time to discover your favourite beach escape in Greece!